Apple’s annual Back to School promotions can be pretty big deals for those who want or need to buy a new computer for school time, and the company has today announced what it will be offering for those who want to pick up a new Mac or iPad Pro. The deal sees students able to claim a free pair of Beats Solo3 headphones, Powerbeats3 or BeatsX in addition to the usual discount that they receive as part of their educational status. According to Apple, it will bundle Beats Solo3 headphones when students pick up a new MacBook, MacBook Pro, MacBook Air, iMac or Mac Pro, although we doubt whether too many will be plumping for that last option. A free pair of BeatsX is up for grabs alongside any purchase of a 10.5-inch or 12.9-inch iPad Pro, too, meaning those who want to go for that iOS lifestyle can still get some free stuff. If you wish to grab the Solo3 or Powerbeats3 with an iPad purchase, you can expect a $150 discount on the headphones. The promotion, available in the United States and Canada, is available to students enrolled in college as well as their parents. Teachers and faculty can also take advantage of the offer although verification is required at checkout regardless of your reason for claiming the offer. 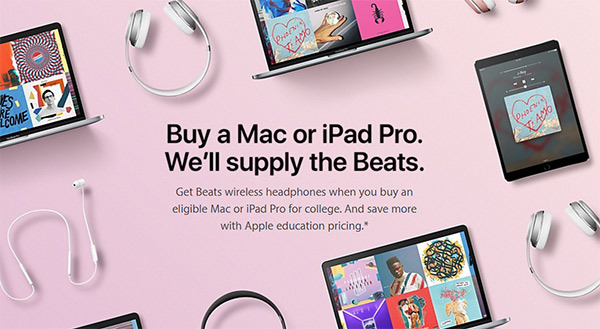 Even without the offer of free headphones, buying a new Mac or iPad Pro from Apple right now is not a bad idea at all if you can claim the Educational Discount on offer. If that applies to you then you could be looking at a saving of up to $300 on eligible Macs and $20 on eligible iPad Pro models. No discount is to be sneezed at, particularly when it comes to some of Apple’s higher end computers and tablet devices. Additionally, Apple is also promoting the $4.99 Apple Music subscription for students, which happens to be half the price that regular users have to dish out every month. Unfortunately, and unlike 2016, Apple is not offering any discount on iPhones this time around. 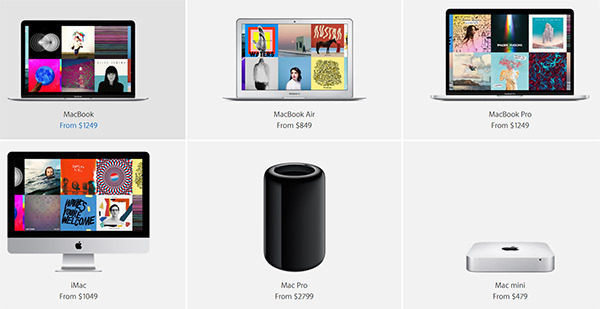 Apple’s Back to School offer is currently available in US and Canada but will expand to other select markets soon. It will be available this year starting from today till September 25, 2017.